A basic plain dome wedding band ring made in cobalt chrome. It looks and feels like a white gold ring but sold at a fraction of the price. 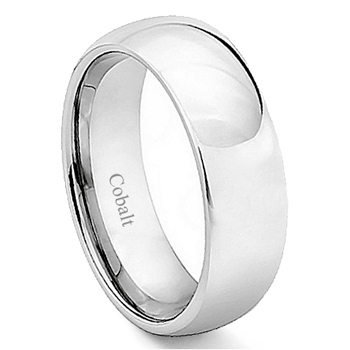 In addition, the white gold color will turn and wear off after a while but the cobalt chrome rings do not have rhodium plating on them and the whole ring is the same color all the way through, so you the color is permanently white. It is also much harder then white gold or silver rings so that it will not bend our of shape. This ring is also available in different widths including 4mm, 6mm and 8mm.